It’s time for North American cities to kill the myth that marked pedestrian crossings are less safe than crossing at unmarked intersections and just get on with the work of making streets safe for pedestrians. Are we ready to get serious about protecting the pedestrian? Last week, I attended my neighbourhood community association meeting to hear a presentation on greenway development. A well scrubbed and well intentioned young “Transportation Technologist” was showing slides of a nice new marked crossing that will connect a ‘greenway’ (basically, a preferred walking route) to a downtown park that is being redeveloped with new amenities. The crossing design itself was fine, including bright overhead lighting. All was good. The 20 or so folks from the neighbourhood were nodding their heads in approval. Then came the kicker: this improvement in pedestrian infrastructure would be accompanied by the removal of a marked pedestrian crossing a block down from the new crossing. This, the Technologist explained, was because “motorists don’t respect crossings when there are more of them.” Motorists behave badly, in other words, so we will punish the pedestrians. This marked crossing will be removed because another is being added down the street. But don’t worry, people were told, because marked crosswalks just give pedestrians “a false sense of security” and (the old, oft-repeated myth), you’re statistically more at risk in a marked crossing than an unmarked crossing. All logic unravelled from there. I politely asked what the Technologist might suggest as design measures to improve pedestrian safety at the crossings – both marked crossings and all those unmarked but legal crossings at every intersection. He acknowledged that there were many ‘good ideas’ out there for better street design but basically avoided the question and moved on to tell other citizens why stop signs, speed bumps, lowered speed limits or other options to slow cars wouldn’t work. In other words, pedestrians use this residential street at their own risk. I have heard so many traffic engineers tell gatherings that they really just want to “protect the pedestrian.” What’s clear, though, is that the traditional road design approaches they prefer are ones that basically keep pedestrians off streets. In fact, maybe we would all be safer just getting in a car every time we leave the house. I exaggerate but for about a century now people on foot have been treated like intruders on the streets that their taxes pay for. It’s time to intervene, to change the focus, to step forward for pedestrian rights. A day after I sat through that public meeting, I was walking downtown to my regular volunteer gig. My route crossed the busy two-lane street that the Traffic Technologist had talked about the night before, about a block down from where the new crosswalk is being installed. Cars often use this street to get from the downtown-fringe residential area onto one of the downtown thoroughfares. It’s a wide right-of-way with nice treed boulevards separating the street from the sidewalk, so it gives drivers the impression of being a wide, clear artery – even though it’s no wider than other residential streets. The distance from sidewalk to sidewalk is about 21 metres (70 feet) – about 6 metres (20 feet) of boulevard on each side and 9 metres (30 feet) of paved roadway. What happened will sound familiar to drivers and pedestrians alike (because, after all, most of us drive some of the time and walk some of the time). I approached the edge of the curb. Remember, this is a 6 metre approach, so my intent to cross is very evident. A stream of cars was passing on the closest lane. I, of course, didn’t expect the first car to stop – it was nearly at the intersection by the time I was at the curb. So I attempted eye contact with car two. Then car three. You know how this works – drivers avoid eye contact and avoid slowing because if they slow that’s an implicit sign to pedestrians that a crossing will be considered. The cars, of course, are in control. A few thousand pounds of metal have that advantage over flesh and bones. There was a slightly larger gap between cars three and four in the stream, so I made my move. I stepped off the curb. The vehicle didn’t slow. I stuck my arm out in front of me, indicating the direction of my walk and my intention to cross and began a second stride. I wasn’t, you understand, being rash or putting my life in jeopardy. Much as I care about asserting my pedestrian rights, I am not about to become a martyr for the cause. The car could still have passed through the intersection without hitting me. But the driver knew what I was up to. He didn’t exactly stop, but slowed to a crawl and I crossed in front of him. I hadn’t yet made it to the far curb when he continued into the intersection and rolled down his window. “That’s not a crosswalk!” he hollered. “It’s a legal crossing for pedestrians,” I yelled back. “Every intersection is a legal crossing.”He waved his hand at me in disgust,rolled up his window, and drove on. The fact is that most claims about the danger of marked crossings are based on non-science or bad science. A traffic planner will say ‘most of our accidents last year happened in marked crossings’ and no one challenges him or her by asking what proportion of total street crossings are made on marked versus unmarked crossings. Let alone ‘illegal’ crossings points (better known as jay walking). The fact is that very few cities have credible data on any of that. It’s a “duh” observation: if more people use the marked crossings, more accidents will happen there. The pseudo science comes in when the traffic planner trots out studies that compare the relative incidence of accidents at the two types of crossings – but the study itself, when one looks, has not controlled for all significant variables. Size of street, length of crossing, average speed of vehicles, visibility. 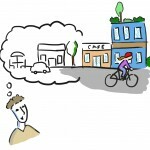 People and streets are more complex than many planners would like to admit. Here’s another thing that the suspect research doesn’t control for: the age and physical ability of the people crossing the street. If you are elderly and walk slowly, perhaps with a cane or walker, and need to cross a busy four lane artery, will you toddle into an unmarked intersection? Research tells us that 81% of these slower pedestrians go to the marked crossing, where they know that drivers are more likely to slow and stop. Now, before apologists jump on my interpretation of the research, let’s admit one thing: on multi-lane roadways (ie. with two or more lanes each direction), a pedestrian has a higher likelihood of being hit at a marked crossing than at an unmarked crossing. The reason? Aside from (as earlier noted) the fact that the demographic makeup of people is skewed to those at more risk to begin with, the biggest factor is vehicles in one lane stopping for the pedestrian but vehicles in the other lane(s) not stopping. The U.S. Department of Transportation has a good summary of the research here. So clearly, on multi-lane thoroughfares, we need stronger measures to get cars in all lanes fully stopped. Progressive jurisdictions are increasingly adding pedestrian refuge islands, which greatly reduce accident rates, as well as mid-street signage so that cars on the inner lane, not just the curb lane, are warned and reminded about the crossing. 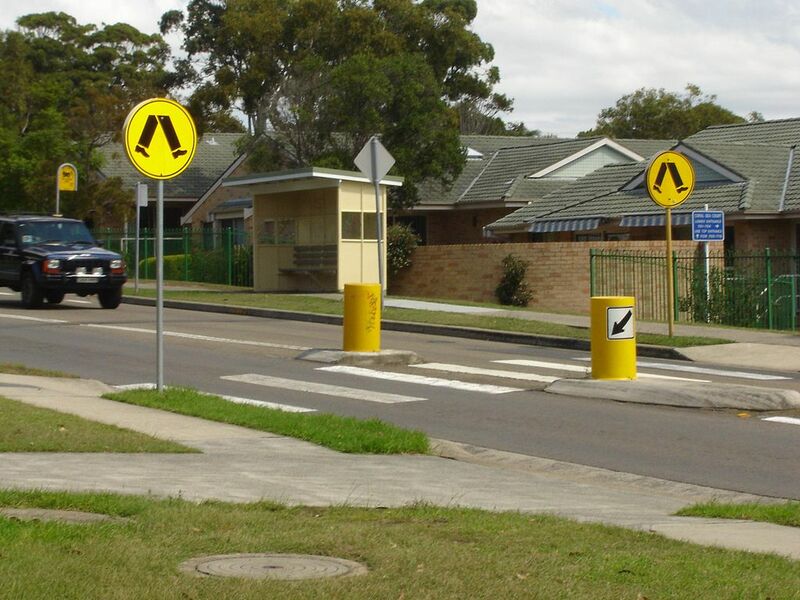 A crossing with mid-street pedestrian refuge and signage, in Australia. But that’s where we need to go: real measures that really make a safety improvement for pedestrians, rather than pseudo-science that implies you’re just unsafe everywhere to what-the-hell let’s not bother with crosswalks at all. Where are crosswalk warning rumble strips? 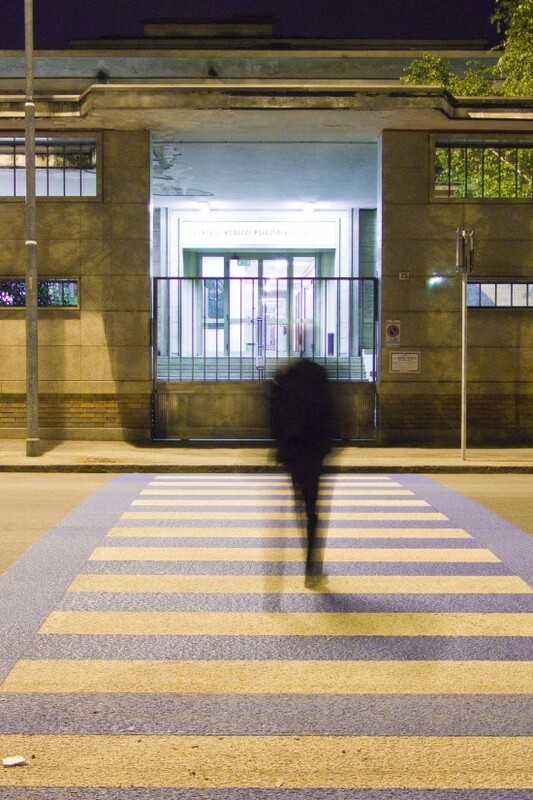 Raised crossings with a different surface treatment (such as brickwork rather than asphalt)? Signage reminding drivers that all intersections are pedestrian crossings? Where, I might ask, are the police forces of North America enforcing the pedestrian’s right to cross and the motorist’s legal requirement to yield? It would feel so good, once in a while, to cross knowing that an officer or two was waiting just down the street to ticket any car that refuses to yield for me. It doesn’t happen. 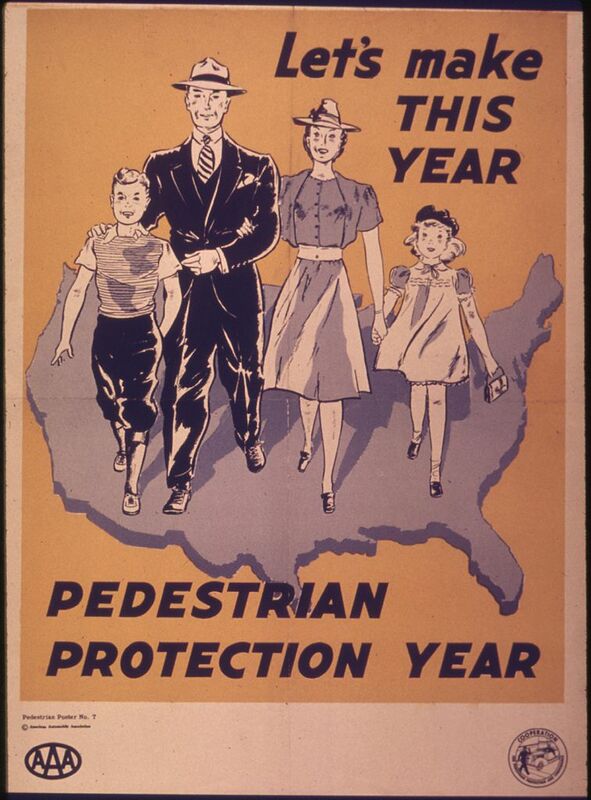 ‘Protecting the pedestrian’ is a cultural myth. About 5,000 pedestrians a year are killed in street accidents across North America and the numbers will increase as our population ages – elderly people are much more vulnerable on our streets. As I was writing this, I spotted one initiative that is a bright spot – at least for high density, high volume locations: New York City’s new Pedestrian / Traffic Manager role. May it be the start of a trend. Legislation in most jurisdictions across North America gives pedestrians significant rights to their streets. Unfortunately, engineering principles based on the free movement of vehicles have far more influence on what actually happens on our streets. I grew up in an era when pedestrians were told, by the design of our streets, that we are only welcome in certain circumstances and only when we don’t inconvenience cars. I want to grow old in an era when we swing the pendulum back and make the public spaces between our buildings places for people, with a special consideration for the times when we are not enclosed in a massive rolling piece of metal. I want to feel welcome on my streets. It is time we met. We too have received such responses in our neighbourhood. The Manual of Uniform Traffic Control Devices of Canada (MUTCD) and Pedestrian Crossing Control Manual of British Columbia as outs are insulting. I once told a Councillor that we needed him to volunteer – to be the fatality to get us the crosswalk (we actually need 4 new ones in our neighbourhood). I later amended the suggestion, thinking a tourist’s dog might get us more ‘mileage’. Thanks for writing this, Lorne. I quite agree. I’ve noticed a lot of problems trying to cross streets all around downtown Victoria. There have been too many serious accidents and deaths involving pedestrians in Victoria in the last few years. Something needs to be done about it. Perhaps we can get together, or ask our respective neighbourhood associations (I’m a member of mine) to write a joint letter to city counsel, or perhaps find a specific crossing that clearly needs improvement and use that to advocate for specific change initially, and as a precedent for more general change. As most of you probably have noticed we have had some improvements at the Blackwood crosswalk but have not been able to get a pedestrian controlled light at either crosswalk. 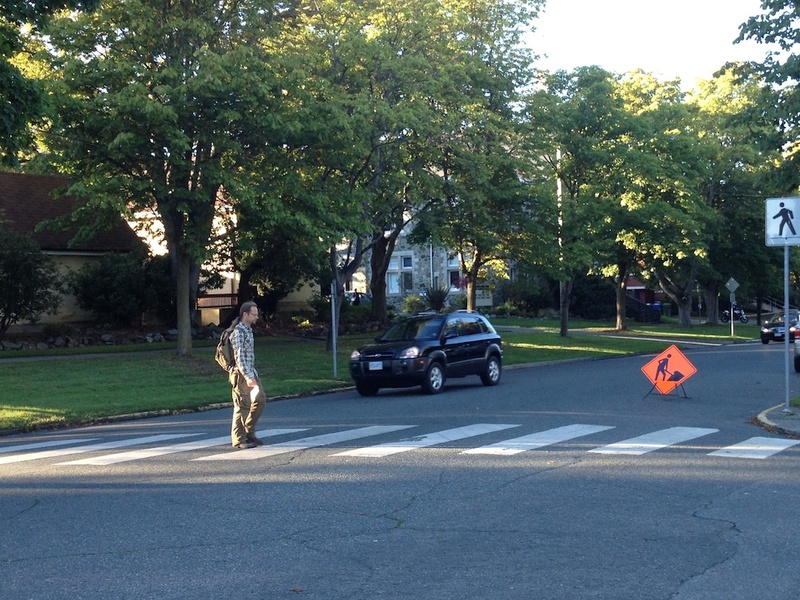 This is partly due to the extremely limited budget the City of Victoria allocates to crosswalks- $100,000 per year. This is enough to fund 1 full crosswalk with median and lights per year in the entire city. Consequently there is a large backlog of approved crosswalk projects. Currently Council is looking at the budget for next year. At tomorrow’s September 26th meeting of the Governance and Priorities Committee Councillor Isitt is putting forth a proposal to allocate more money for pedestrian and cycling infrastructure out of the current infrastructure budget. You can also email the Councillors individually. Please send an email even if it is after September 26th as budget decisions will be made over the next couple of months for next year. Perhaps an enlightened (and sadistic) mayor or general manager can take away the transportation department’s cars for planners, engineers, and managers; prohibit expensing taxi fares; and forbid them to drive to work. At least for a year. Great post Lorne. The pedestrian/vehicle face-off is one we all face. 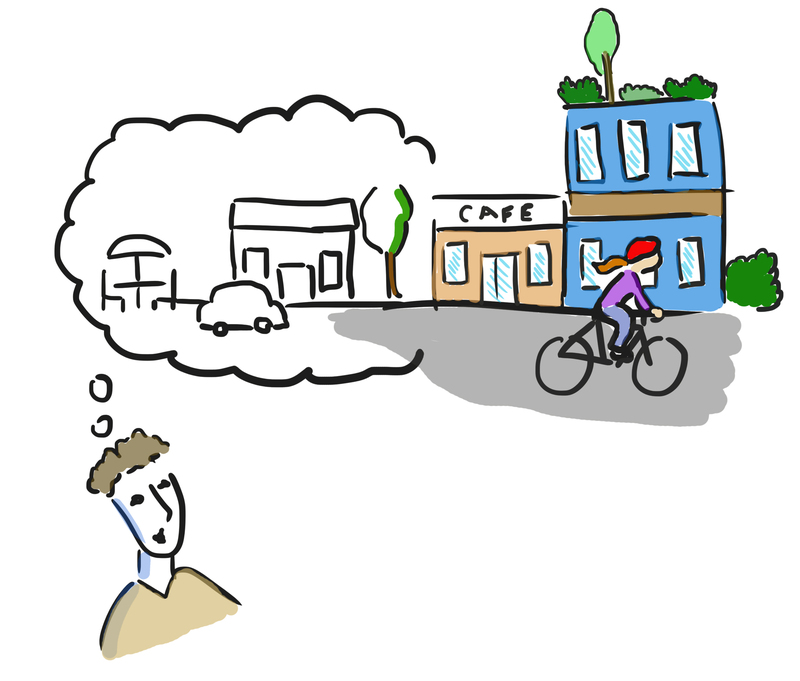 We need a cultural mind shift, from car to people benefits, and those don’t come easy. It would be nice if our community transportation ‘officials’ appreciated the nuances of transportation/space psychology & behaviours as well as you! Just saying. Thanks Marg, Daniel, Shylene, ‘Big Z’ and Ben. Most of us have had too many ‘close encounters’ with cars. As I mentioned in the article, I drive too, so I’m aware that I’m sometimes that driver who could be more attentive. The key thing, I think, it so revisit how we design the whole car / pedestrian interaction at intersections. Phrases like “pedestrian first” sound nice in planning documents but are rarely reflected in reality. My awesome innovative plan was to suggest pedestrian over passes be built. Costly yes, adding travel time to the walker, rider so on a so forth….yep. But I thought the total separation of driver and pedestrian would save lives, but now I’m just annoyed. Reading your post and also recently seeing ‘The Human Scale’ a doco I’m convinced we’ve just planned wrong from the beginning! Cars are valued so much more than mere human life and it angers me. Our towns, cities not to mention roads have all been designed to accommodate the car which is one of the biggest polluters in our modern world and yet ordinary people on their own two feet are made to feel unwelcome, unwanted and totally foreign….we’re the inhabitants here on Earth and yet we’re making the car?!…. feel at home? Argh….anyway, thank you so much for this post. But also not ‘thank you’ as I will be recreating my essay now….